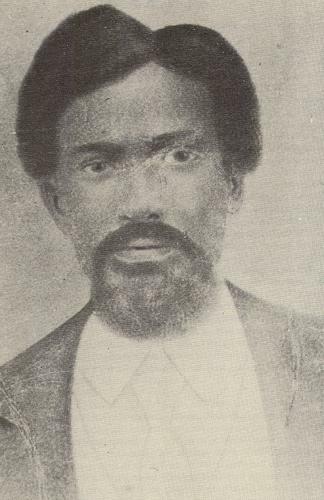 Matthew Gaines, black senator and Baptist preacher, was born on August 4, 1840, to a slave mother on the plantation of Martin G. Despallier in Pineville, near Alexandria, Louisiana. He learned to read by candlelight from books smuggled to him by a white boy who lived on the same plantation. Gaines escaped to freedom twice but each time was caught and returned to slavery. His first escape came after 1850, when he was sold to a white Louisianan and was subsequently hired out as a laborer on a steamboat. Using a false pass, he escaped to Camden, Arkansas. He left Arkansas six months afterwards and made his way to New Orleans, where he was caught and brought back to his master. Later, Gaines was sold to a Texas planter from Robertson County, and in 1863, he made another escape attempt. His destination was Mexico, but he made it only as far as Fort McKavett in Menard County before being caught by the Texas Rangers. He was taken back to Fredericksburg, Texas, and remained in that area until the end of the Civil War. During his tenure as a slave in Fredericksburg, Gaines worked as a blacksmith and a sheepherder. After Emancipation Gaines settled in Burton, Washington County, where he soon established himself as a leader of the black community, both as a minister and a politician. During Reconstruction he was elected as a state senator to represent the Sixteenth District in the Texas Legislature. Gaines was a vigilant guardian of the rights and interests of African Americans. Among the many issues he addressed were education, prison reform, black voting rights, the election of blacks to public office, and tenant-farming reform. To encourage educational and religious groups to work toward educational improvement in their communities, Gaines sponsored a bill that called for exempting such organizations from taxation. Buildings and equipment used for charitable or literary associations were also exempted; the bill became law on June 12, 1871. Gaines also supported a Militia Bill which promised protection for freedmen seeking to vote and he made a concerted, but unsuccessful, effort to drum up support to elect a black Texan to the United States House of Representatives. Gaines was elected to a six-year term in the Texas Senate, but served only four years because his seat was challenged when he was convicted on the charge of bigamy in 1873, and he subsequently relinquished his post. Gaines continued to be active in politics and made his political views known in conventions, public gatherings, and from his pulpit. He died in Giddings, Texas, on June 11, 1900. Merline Pitre, Through Many Dangers Toils and Snares: The Black Leadership of Texas, 1868-1900 (Austin: Eakin, 1985).